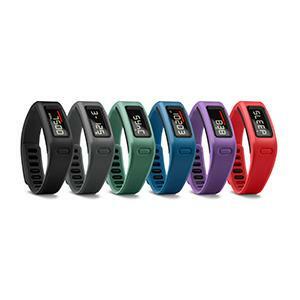 Earlier this year, Garmin, a company known for its GPS watches and navigation systems, introduced the Vivofit, an activity tracker you wear on your wrist. The Vivofit counts your steps, monitors your progress toward daily step goals, notifies you when you've been still for too long, and estimates distance and calories burned. 1. It's easy to use - I get kind of overwhelmed by technology. One of the reasons I've never owned a Garmin before is that GPS watches scare me. Buttons, satellite connections, data uploads. It quickly gets to be too much. The Vivofit has one button that I can use to click between the time, date, steps taken, steps remaining to reach my daily goal, mileage, and calories burned. I hold the same button to sync it with my phone, and hold it longer to let the watch know when I'm going to sleep. 2. It motivates me - It's crazy how much one little number can mean. I leave my Vivofit on the step-counting screen, and often find myself looking at it throughout the day. I get annoyed if I run/walk less one day than I did the last. It also has a red bar that appears on the screen and grows if I'm inactive for too long. I hate that bar. It keeps me moving. 3. It looks good - I don't often have to dress up. I work in a running store! But when I do dress up, a slim black band doesn't ever look out of place. Plus, everyone is wearing them these days!